In August of 1964 Charley Taylor was the MVP of the College All-Star game versus the NFL champion Chicago Bears. The All-Stars lost 28-17. Taylor, who is best known as a wide receiver for the Redskins, played halfback for Arizona State. Taylor figured in all 3 score for the All Stars. He made a leaping 29 yd reception to set up the field goal to give them the early 3-0 lead. He recovered a muffed punt by the Bears, then threw a touchdown pass to Colts draft pick, Ted Davis to regain the lead. In the second half he was on the receiving end of a touchdown pass from 49ers draft pick George Mira. 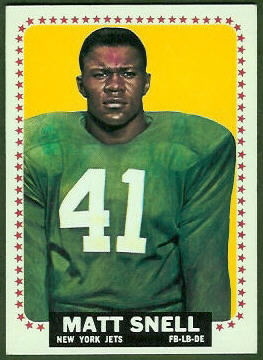 The entire 1964 Philadelphia NFL set had only 198 cards and Charley Taylor was not not included. After winning the Rookie of the Year, he would be included in all major issues from 1965-1976. He was selected to the Pro-Bowl 8 of his 13 NFL season. He was inducted into the Hall of Fame in 1984. The AFL Rookie of the Year, Matt Snell was included in the 1964 Topps set. In 1964 Topps lost the license to make NFL cards and gained the rights to the AFL from Fleer. Snell was a 3 time AFL All-Star for the Jets, and rushed for the first touchdown in the Super Bowl III upset over Johnny Unitas and the Colts. Last night the American League won their 3rd straight All Star Game. In 1983 the AL had won their first ASG after losing 11 straight. The game was at Comiskey Park in Chicago. It was the 50th anniversary of the original ASG which was part of the Chicago Worlds Fair. The National League's honorary captain was Ernie Banks. 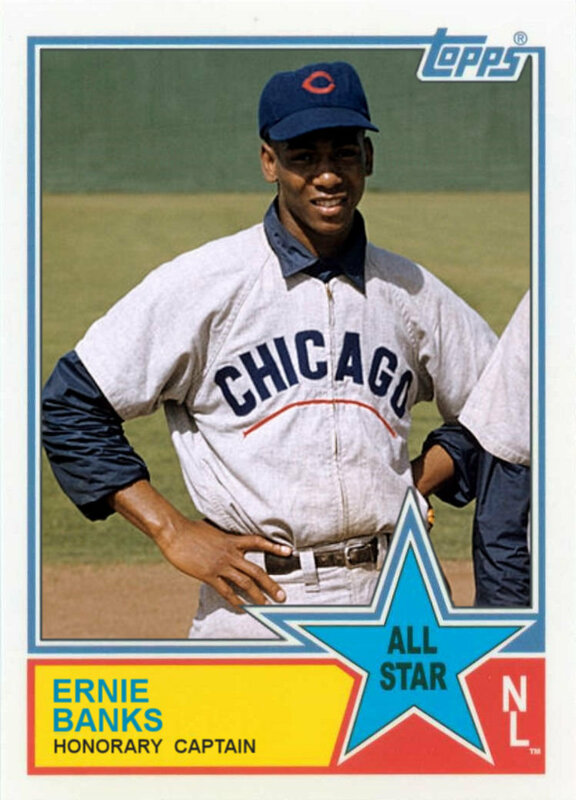 Although the game was played on the south side, Ernie's name is synonymous with Chicago baseball. He played his entire 19 season career in a Cubs uniform. An All Star 14 times and a back to back NL MVP (1958 & 1959), "Mr. Cub" was a first ballot Hall of Famer in 1977. Joe Cronin was chosen as the AL's honorary captain. Cronin was the starting shortstop for the American League in the first ever All Star game. Back then he was a member of the Washington Senators. He went 1 for 3 with a walk and a run scored. The AL won 4-1. Cronin was runner up for the AL MVP in 1933 finishing behind fellow Hall of Famer, Jimmie Foxx. In 1933 Cronin was in his first year acting as player/ manager of the Senators. The following year he would manage and play shortstop in the 1934 All Star Game. The Red Sox traded for Cronin after the 1934 season. They gave up their starting shortstop, Lyn Lary and $225,000 (roughly $4 million in today's dollars). 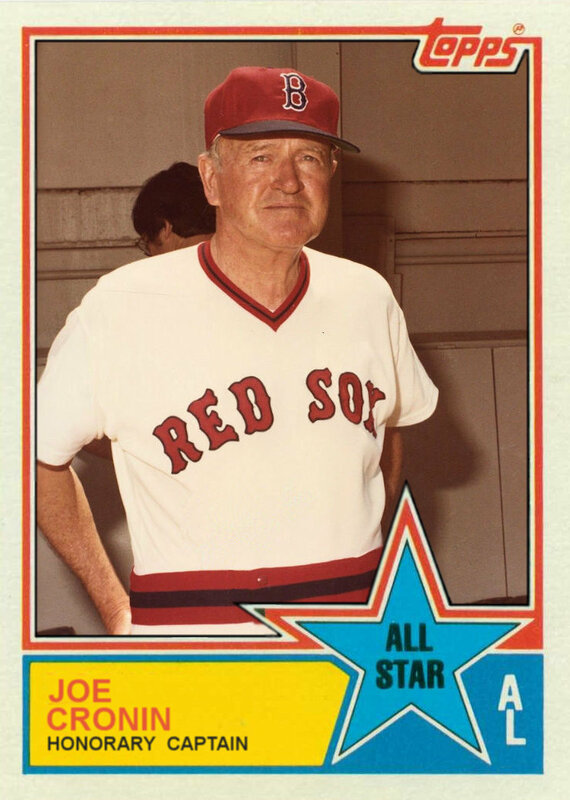 Cronin would serve as player manager of the Sox for 11 years and just manager for 2 more. In 1956 he was inducted into the Hall of Fame. About the game: A former Southern Illinois University "Saluki", Dave Stieb was the starting pitcher. He pitched 3 inning of no-hit ball. But he gave up an unearned run on 2 errors to the game's first 2 hitters. Both were grounders to the pitcher. The first was an error on Stieb's throw to first. The second was on first baseman Rod Carew's catch. After spotting the Nationals a one run lead, Stieb was lights-out. He retire 9 of the next ten hitters, striking out 4 and allowing only one baserunner on a walk to Al Oliver. MVP honors went to Fred Lynn of the Angels. Lynn belted a Grand Slam as part of the AL's 7 run 3rd inning. Atlee Hammaker, in his only All Star appearance gave up 3 singles, a triple, an intentional walk and 2 homers including Lynn's slam. The final score was 13-3 with the decisions going to both starting pitchers. Steib got the win and Mario Soto got the loss. 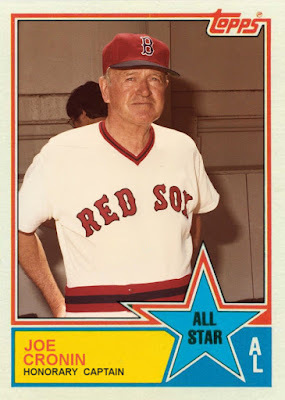 About the cards: In 1982 Topps went back to having separate all star cards rather than incorporating an all star designation on their regular issue cards. I struggled with whether to use regular issue cards or use the All Star cards from that years set. I actually think the 1983 AS cards are decent looking but the regular issue cards are much nicer. And as we move further into the '80s the divide only gets worse. If anybody that reads this far down into the text has an opinion on this subject, please leave a comment. Hopefully, I will still be blogging by the next All Star break and I am really undecided on how to proceed, but we have plenty of time. About the photos: Normally, I use photo's from the playing days, but Cronin retired from playing and managing in 1947 so I could not find a decent color photo. I did find this picture of him wearing a mid '70 era Red Sox uniform. I'm not sure what the occasion for this was. At the '83 All Star Game he was looking good in a vintage Washington Senators uni. 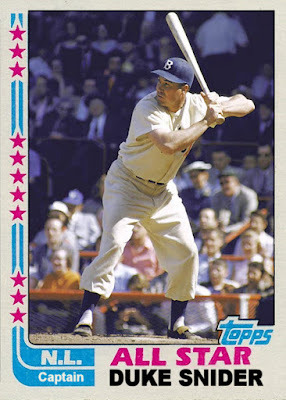 It doesn't look exactly authentic for the era (no pinstripes and the '60s era curly "W"), but it was a nice looking throwback uni anyway and I wish I could have found a decent photo of it to use on his card. But since I didn't here is a video I found on Youtube. It is the AL introductions for the All Star game. At the end Banks an Cronin come out. Banks is also wearing an inaccurate uniform. 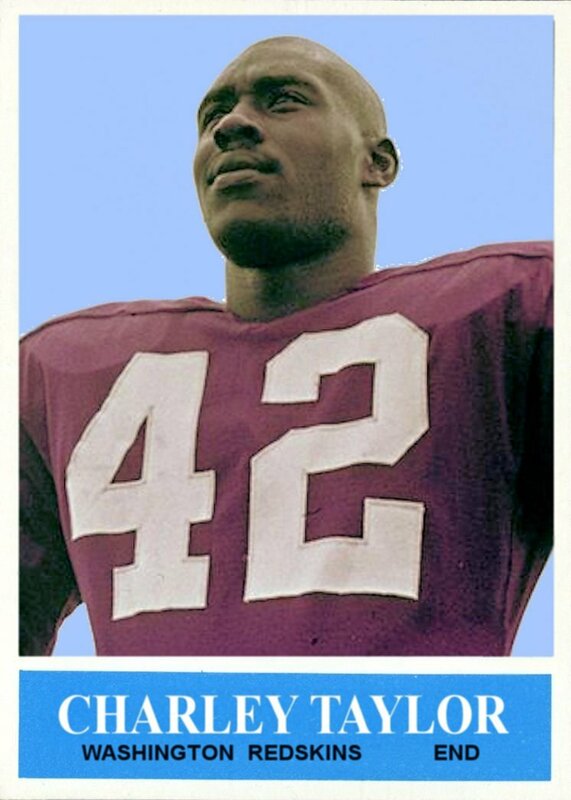 He never had his name on the back of a home uniform during his playing days. In fact the Cubs didn't have names on the backs of their home jerseys until 1993. Ten years after Banks appeared in this video with his name on the back of his jersey. Tonight is the All Star game, so as part of my annual ritual, here are some more Honorary captains. These are the 1982 captains. For the first time since 1974, Topps had separate cards for the All Stars. The 1975-1981 sets had an All Star design incorporated into the regular issue cards of the players. For the first time in MLB history, the 1982 All Star Game was played outside the United States.The Montreal Expos hosted the event in Olympic Stadium. 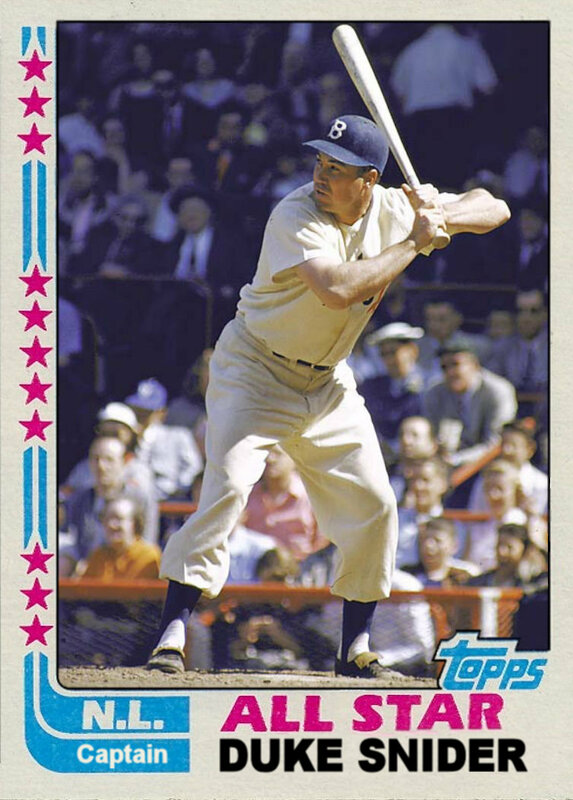 The Captain of the National League was Duke Snider. Snider played briefly for the Montreal Royals in the 1940's before being called up to the Brooklyn Dodgers. The 8 time All Star centerfielder was inducted into the Hall of Fame in 1980. Yogi Berra was the AL honorary captain as well as a member of the Yankees coaching staff in 1982. 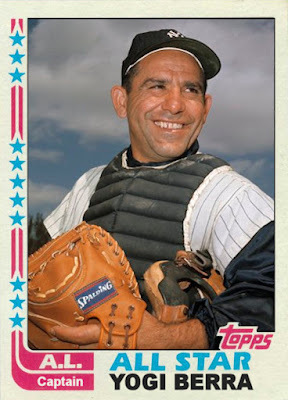 A 3 time MVP and 18 time All Star catcher, Yogi had 10 World Series rings as a player and 3 more as a coach. I'm not sure which is the bigger travesty; that the writers took 11 votes before inducting Duke Snider into the Hall or that it took them 2 to induct Yogi. The AL jumped out to an early 1-0 lead in the top of the first inning of the 1982 All Star Game. Lead-off -man-extraordinaire Rickey Henderson scored on a Reggie Jackson sac-fly. After that it was lights out. The Nationals took the lead on MVP Dave Concepcion's 2 run homer in the bottom of the 2nd inning and the NL won the game 4-1. This was the NL's 11th straight All Star victory. The All Star break in upon us once again. So here a few additions to my All Star Game Honorary Captain collection. 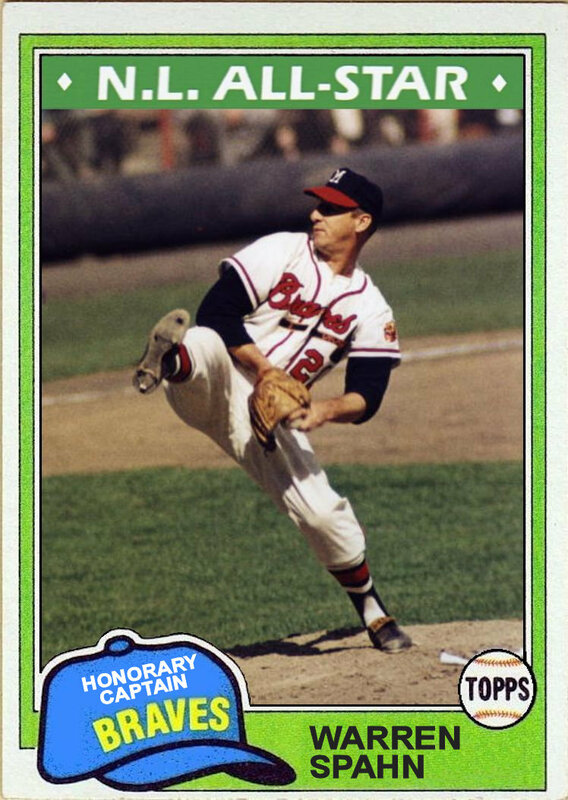 Warren Spahn represented the National League as Honorary Captain in the 1981 All Star Game. Spahn's heroics on the field earned him 17 All Star appearances and 13 20-win seasons, He led the league in ERA 3 times, strikeouts 4 times, shutouts 4 times, victories 8 times and complete games 7 times. He earned The Sporting News Pitcher of the Year Award 4 times, The Cy Young award in 1957 and The Lou Gehrig Award in 1961. In 1973 he was voted into the Hall of Fame. 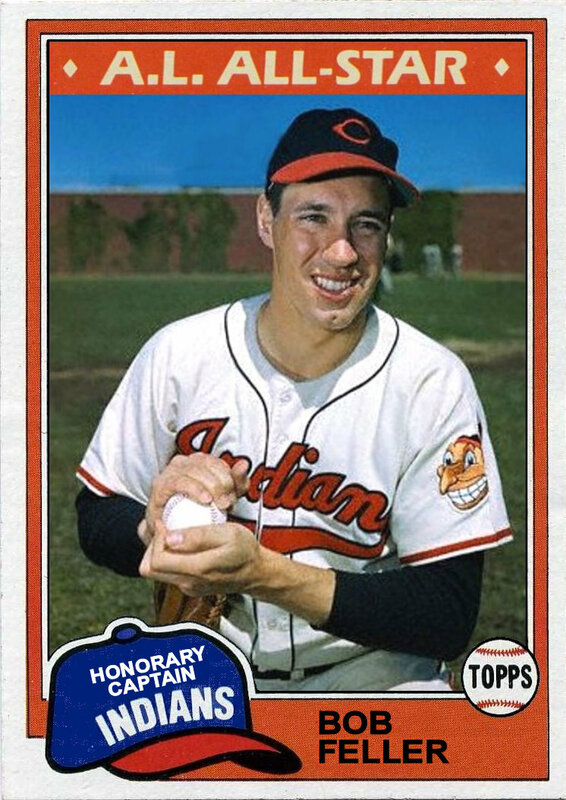 The hometown hero, Bob Feller represented the American League as honorary captain at the 1981 All Star game in Cleveland. Feller was a triple crown winner in 1940, leading the league with a 2.61 ERA, 27 wins and 261 strike outs. He was an 8 time All Star and led the league in victories 6 times and in strikeouts 7 times. He had 3 career No-Nos and was inducted into the Hall of Fame in 1962. It is worth noting that both of these pitchers left the comfort of the MLB to join the armed forces in their prime. Feller was the reigning pitching champion, having led the league in victories 3 consecutive years leading up to his 3+ years serving as an anti-aircraft gunner chief aboard the USS Alabama. In his first full season back he led the league again and was selected to the AL All Stars. Although Spahn was a rookie before serving, in his first full season back he led the league in ERA and was selected to the NL All Star Team. Spahn's military career held nearly as many awards as his baseball career. He was a combat engineer who fought in the "Battle of the Bulge". He received a Purple Heart after taking shrapnel to his foot. His unit was awarded the Distinguished Unit Emblem and he received a battlefield commission to second lieutenant. As for the game itself, this would be the 4th and final time the game would be held at Cleveland's Municipal Stadium. The game was rescheduled to August 9th because of the baseball strike. It still holds the attendance record for All Star games with 72,086 and the most players used with 56. The NL won 5-4 with all of its runs scored via the long ball. Gary Carter had 2 solo homers and was named MVP. Dave Parker also soloed and Mike Schmidt had a 2 run homer to give the NL the victory.